It’s all treats and no tricks at the Cofrin Library the week of October 31. The Library will be holding a Book Salespalooza from Monday (Oct. 31) to Sunday (Nov. 6). We are cleaning out the back room and offering everyone a great selection of new and used books. There will be paperbacks, non-fiction, children’s books, textbooks, and much more… and the best part is everything is only $1 per book. Sale carts will be located on the Plaza Level of the Cofrin Library. “Shop early and often for the best selection! Even if you can’t make it until half-way through, you’re bound to find a gem!” For more information, contact Leah Liebergen at liebergl@uwgb.edu. Thanks to everyone who stopped by today and voted for their favorite pumpkin. 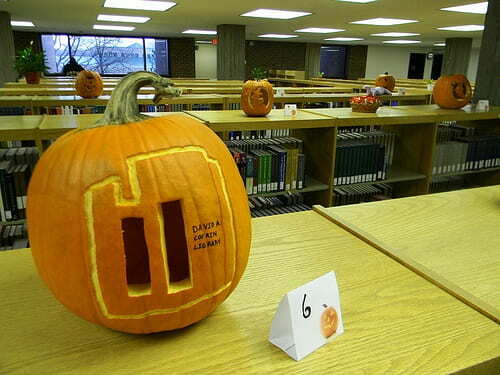 Our library staff & student workers have some mad carving skills! For the full set of pumpkin pics, check out our Flickr gallery. 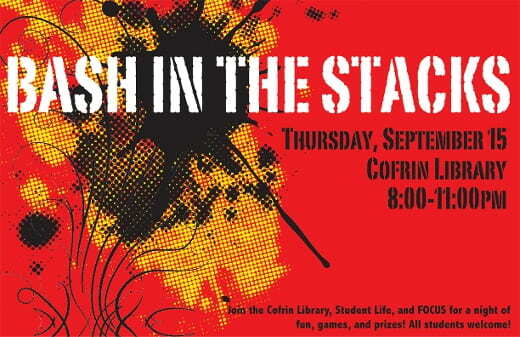 Stop by Cofrin Library on Thursday, September 15 for our annual welcome back party! Free food, games, and prizes! Nerf tag in the library? Absolutely! We’ve even expanded it to two floors this year to meet demand. Feeling pretty? Stop by the photo booth with your friends and everyone gets a photo strip to take home. Do you enjoy performing ridiculous tasks in a short amount of time in front of an audience? Then “Phinish in a Phlash” is for you. There will be plenty of games and prizes for everyone! Free pizza and soda! For more info: Check out our Facebook event page or view last year’s video highlights. In his talk, The Truth About the Civil War, Michael Edmonds will unveil an amazing new digital collection and discuss how everyone from genealogists to re-enactors; from students and teachers to scholars can enjoy it. The Wisconsin Historical Society launched an ambitious project to make original materials about the Civil War available in a free, searchable electronic format. This new collection, Wisconsin in the Civil War, contains thousands of photographs, diaries, memoirs, letters, battle maps, and eyewitness accounts created by Wisconsin soldiers. 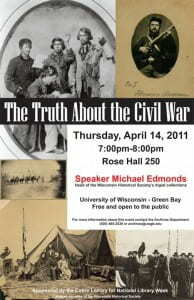 For additional information contact the Archives at (920)465-2539 or archives@uwgb.edu .